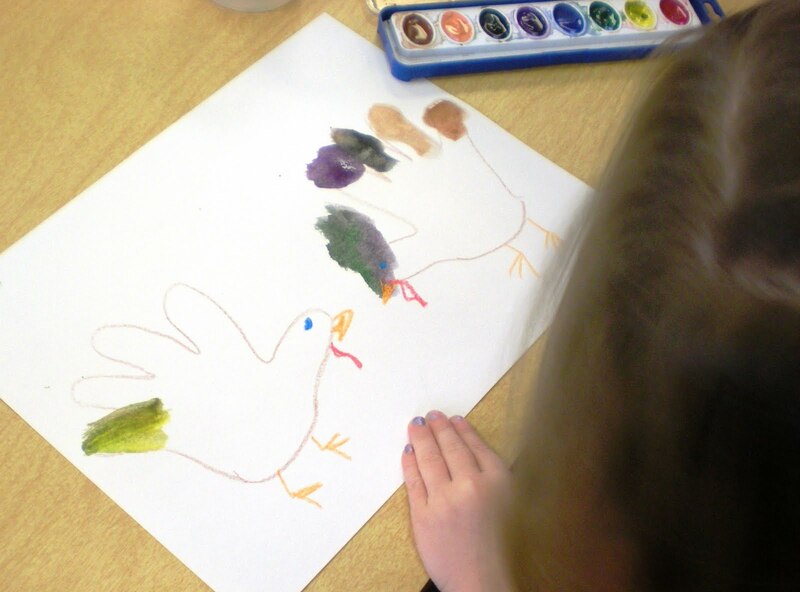 Thanksgiving is next week, so of course we concentrated on those great turkeys this week. 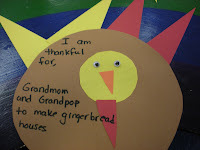 The picture above is from this year's interactive November bulletin board. The children did a great job. 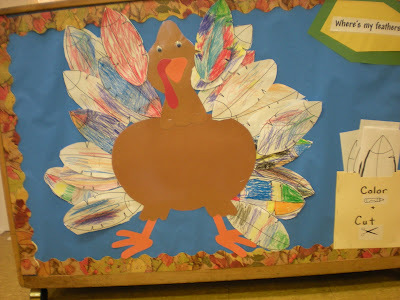 We did two turkeys this week. 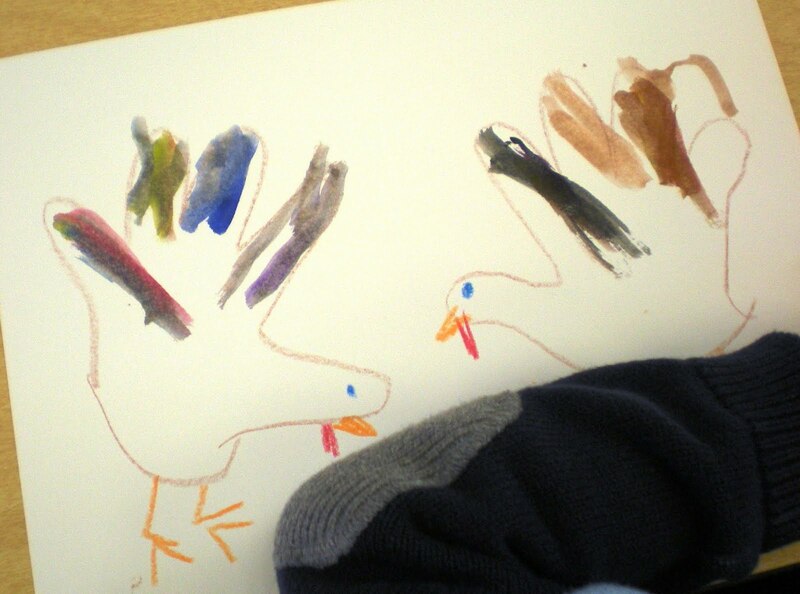 The wonderful and ever fascinating(to little ones), handprint turkey. 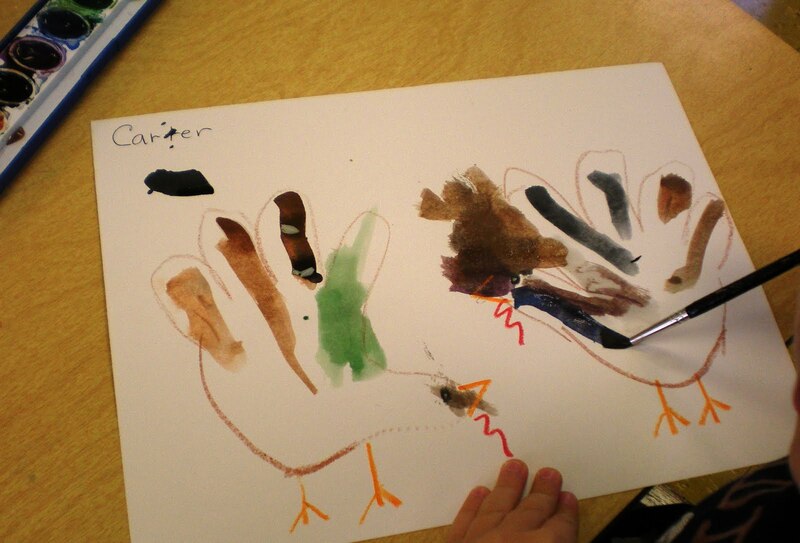 The children all got to watercolor two of these turkeys on Tuesday. 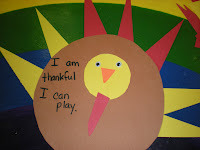 We had some pretty wet turkeys when they were done. It's a good thing they had a couple of days to dry so they could go home this week. 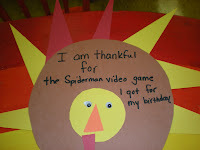 Our other turkey had to do with things the children were thankful for. I had a cute new book to read to the children at the beginning of the class. 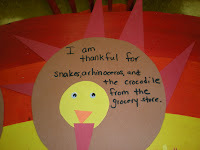 I thought it would be helpful to show the children all the wonderful things in their world that they should be thankful for. 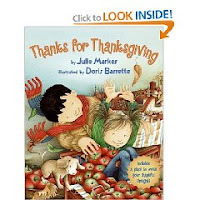 The book is called, "Thanks for Thanksgiving," by Julie Markes, illustrated by Doris Barrette. The thankful turkey was made with simple shape; circles, and triangles. 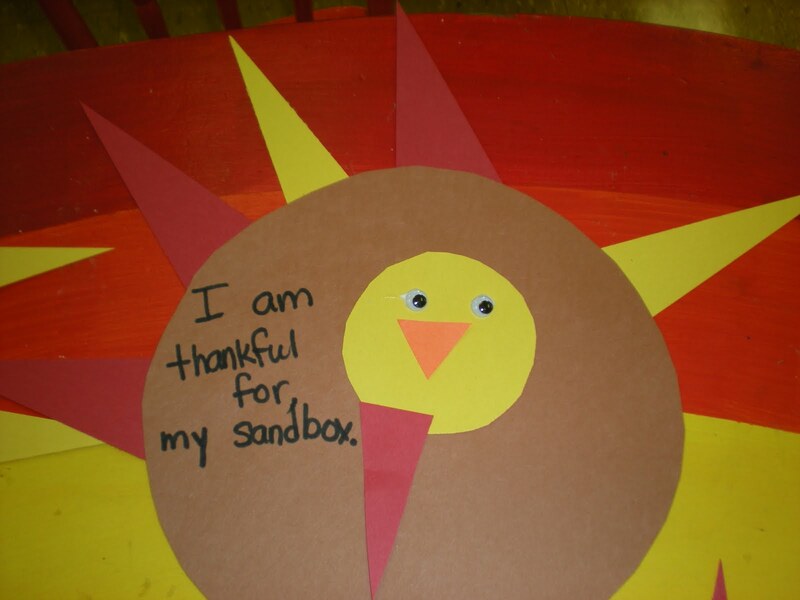 After the children put all the pieces together they told me something they were thankful for. What a difference between the two classes. 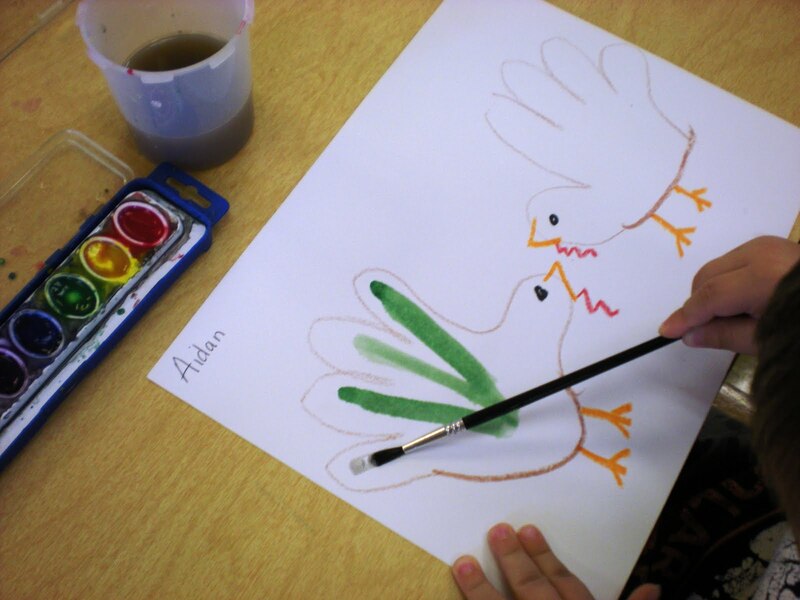 With the AM class you had to watch out for that "parrot" response, the response that are all the same. The PM class was a little more insightful, all unique ideas. We now have a week to get everything together for Christmas! Did I really say that? Lovely post and fantastic creative activity with the kids. I loved the pics too. 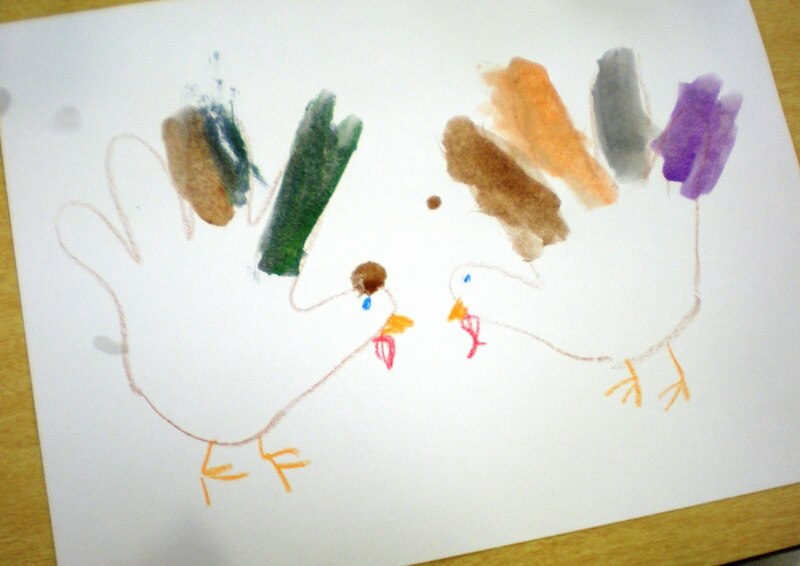 You know, I've never done the hand print turkeys at preschool. I wonder why? Think we'll have to do it next week. 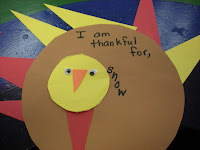 I'm so glad I don't have to do Christmas stuff at my little secular school. I feel like there's so much build up about the holiday that I like to think of school as their oasis away from it. I love all of the turkeys! Your classroom turkey is a great way to show them how they can make something wonderful together as a class. Before I use your ideas I want to be sure it's okay. 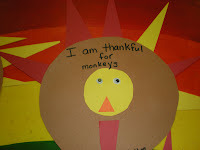 I have a small homebased daycare and some of your ideas would be so perfect for my little ones. Is it okay if we copy some of your ideas?